Bryan lost his friend to Hodgkin's lymphoma, but later saved the life of a stranger suffering from the same disease. "Hello, this is Gift of Life Marrow Registry. We're calling with good news, you're a match for a patient!" You’ve received a phone call telling you that you’re a preliminary match for a patient. Congratulations – you have been given a unique opportunity to save a life! Your decision to donate is a special commitment. Somewhere in the world a patient is suffering from a life-threatening condition that may be treated by a bone marrow or peripheral blood stem cell transplant, and you may be that person’s match! How did they find me? What does it mean I could be a match? Every volunteer donor is listed in the worldwide registry with a unique donor number, date of birth, gender, and most importantly, their HLA tissue type. The patient has also had their HLA tissue type analyzed by the physician or transplant center, and by entering that information in the database, it is possible for them to find potential matching donors who are in the registry. If you are called as a match, the first step is Confirmatory Typing – which is exactly what it sounds like, a test to confirm the results of your swab kit, and identify exactly how closely your HLA match the patient’s. Confidentiality: Gift of Life maintains your privacy by identifying you to the recipient’s transplant center by your unique donor number. Neither the recipient nor the transplant center staff learn your identity. Testing of buccal swabs is for Human Leukocyte Antigens (HLA); we do not test your DNA. Gift of Life uses state of the art electronic security measures to safeguard the registry’s database, including firewalls, data encryption, and password-protected user access. Facilities are secured with electronic and mechanical locks that limit access to authorized personnel only. You have a right to your medical information and we are happy to send it to you or your designated representative with a signed medical release form. Just as your identity is strictly confidential, so is that of your recipient. Gift of Life only receives your recipient’s age, gender and diagnosis. The only information that Gift of Life receives is the patient’s gender, age and diagnosis. The patient may be located anywhere in the world. Because the HLA factors that determine matches are inherited like hair and eye color, the patient is likely to be someone from the same ethnic group. To learn more about tissue typing and why ethnicity matters, click here. Without a donor, the patient will have no chance of survival. A transplant donor is being sought because this is the only possible treatment for this patient. Because every patient and their medical conditions are different, there is no way to predict the outcome of the transplant. Detailed statistics about transplantation are available from the Center for International Bone Marrow Transplant Research at www.cibmtr.org, with data categorized by many factors. What happens during Confirmatory Typing? If you agree to go ahead with Confirmatory Typing, you will be sent to a laboratory or physician near your home for them to take blood for HLA testing. Even though your HLA types were tested after your initial cheek swab, this more detailed analysis will confirm your HLA type. In addition to confirming that you are a match for the patient, several tests will be done to check for certain infectious diseases that would prevent you from donating, such as hepatitis. As part of this process you will complete a consent form stating that you intend to proceed with the donation, and a Health History Questionnaire, which evaluates your current health condition. Can I choose whether to donate peripheral blood stem cells or bone marrow? The transplant center usually requests a specific type of transplant that will offer the best chance for the patient’s recovery. Today, approximately 80 percent of donations are peripheral blood stem cells, with the remaining 20 percent requesting bone marrow, most often for children. 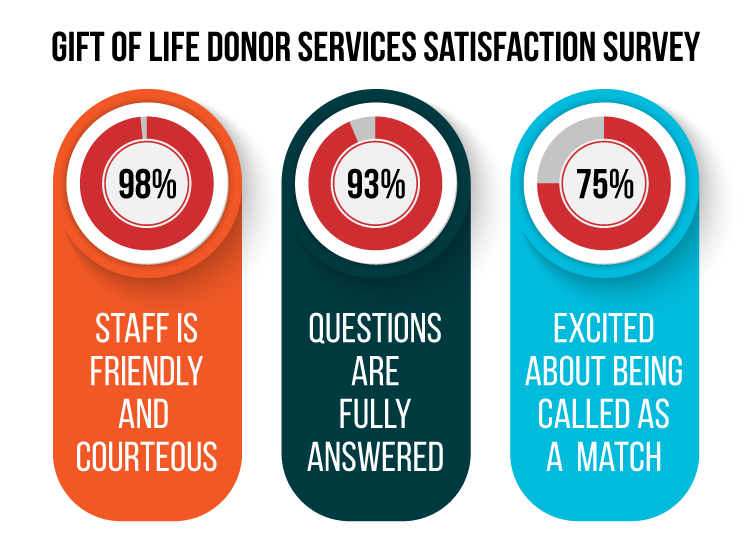 If you feel strongly about donating only peripheral blood stem cells or bone marrow, please let your Gift of Life coordinator know in order to discuss your options. When do I find out whether the match is confirmed? You are confirmed as a match and asked to proceed to the next stage, which is called Workup. You may be released from donation for a variety of reasons. The two most common reasons for releasing a donor is that someone else is a closer match, or the patient is not ready for transplant. You may be placed on hold. This means the patient does not need you immediately, so you are, in effect, on standby. Gift of Life will update you periodically during the time you are on hold, until you either move on to the workup stage or are released from hold. If three months go by and the patient still is not ready, you will be returned to the registry for future searches. Are there other people who match? Gift of Life does not know whether you are the only match or if there are multiple matches for a patient; only the patient's transplant physician or transplant center has that information. If you are called as a match, you should be confident and comfortable with your decision to move forward with the process. Early in the process we ask you to sign an intent to donate form, in effect, that you are making a personal pledge to donate and save a life. Commitment to completing the process and making the donation is incredibly important: someone’s life depends on it. This is not optional for the patient – without a transplant he or she will not survive. When the patient is being prepared for the transplant, their entire immune system and bone marrow will be eliminated through chemotherapy and radiation therapy so that the transplant and their own immune system will not fight each other. When the patient receives the transplant, they are getting an entirely new immune system., free from the life-threatening disease or condition. The patient’s chance at life depends on you completing the donation. You have the right to withdraw at any time, but once the recipient undergoes the transplant conditioning regimen, he or she will not survive without your donation. I’m a perfect match! What does that mean? When the Human Leukocyte Antigens that you inherited from your parents turn out to be exactly the same as those of the patient, it is said to be a perfect match. This means that ten HLA factors are completely matched, providing the best chance of a successful transplant. To learn more about Finding a Matching Donor, click here. Once the Confirmatory Typing results are available and you are asked to become the lifesaving donor for a patient, you will be asked to move on to the next stage, Donor Workup.